At one point, I shared with our fellow travelers the roots of the concept of “sauntering.” Though the etymology of the word is uncertain, there are two ideas that definitely related to our Israel tour. The first thought is that the word comes from San Tierra (Holy Land), and those who went on a pilgrimage were called “Saunterers” (Holy Landers), thus “saunterers.” To go sauntering was to go on a pilgrimage to the Holyland. Another plausible root—which is somewhat related—is that the word comes from the old English “santren,” meaning “to muse.” Under this idea, we take a leisurely stroll to clear the mind and think things over. Both meanings would fit our amazing, though not always “leisurely,” pilgrimage to Israel. As with everything in life, the “companions of the road” make the experience what it is. We were joined with 50 friends and fellow-saunterers, each adding to our company with their own personality and curiosity, and each treasuring up the great fellowship shared along the journey. As the family is incomplete with even one member missing, our fellowship would have been incomplete without each and every participant. It was a special joy for Nan and me to not only see the sights, but so much more to see the looks of wonder on each face at various stops on our journey. My memories are far more filled with faces than places as I recall looking over our company, hushed in the Synagogue of Capernaum, or on the Mount of Beatitudes, during the exposition of relevant Scriptures. Or, I see the faces streaming with water, coming up from baptism at dawn on the Sea of Galilee. Then the smiles of contentment as we rocked on the boat in the sunshine, and laughter as we clumsily tried to learn an Israeli dance on the gently rocking deck. Again, I see the various expressions at the empty tomb; from joy to wonder, and smiles to tears. And to be met there, and guided, by a brother from Sweden, who so clearly and simply—and with evident joy—laid out the Gospel message as we viewed Golgotha and the Garden of Gethsemane, then quietly disappeared from our midst. No camera could capture the rapidly shifting looks and expressions which we all hold in our memories, or the many words of insight, encouragement, or amazement along the way. No record but that kept by God Himself can retain the acts of service, sacrifice, and selflessness we witnessed as we journeyed together. The helping hands over rough passage, the lifting arms and compassionate hearts—these are the real treasures of our time in Israel. For in the end, the land of Israel is a geographical place where great lives and events once happened, and will happen yet in the future. But in the simple words and actions of our fellow pilgrims, Jesus Christ manifested Himself, walking with us through His chosen land. I send my humble thanks to each of you who shared this journey for what you showed to me and to one another of His presence. We all with one heart give our appreciation to the pastors who journeyed with us—giving greater insight and understanding to the various places we visited and events we studied. Our thanks to pastors Mike Bryant, John Francis, Jamie Short, Pete Stadler, and Mike Roddy. Short of a book, it would be impossible to give a detailed account of the entire tour. As with the faces noted above, so the places come to mind—not in the order of an itinerary, but randomly, with a mixture of sights, sounds, subtle impressions, and shared experiences difficult to convey. It’s very much like trying to convey a street scene in India to someone, without being able to include sounds, smells, and emotional impact. As with life, often the memorable things, the lasting impressions, come from the unplanned or unexpected, the “surprises” along the way. When we arrived in Tel Aviv, we were met by our guide Ezer, only to learn that his father Motti was very ill, and would not be able to join us as planned. 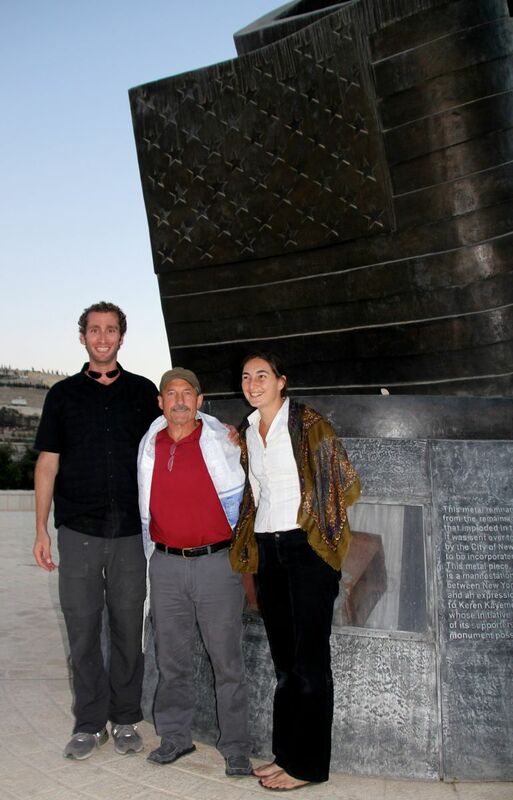 On our previous tours, Motti and Ezer had guided us as a team, and we became very close to both of them so we were sad to hear that our dear friend was sick. Ezer, however, reflects all the skill and professionalism of his father—with his own unique brand of humor thrown in. He guided us with all the patience of a shepherd, though often no doubt he felt like he was herding cats! Like a skillful magician, he kept pulling from his hat new and unexpected sights and experiences. We enjoyed an after-dark Bible class on the slopes of Mount Carmel, concluded with a special prayer time for America, and the elections taking place the next day (more thoughts on the elections in a later post). We were able to visit an IDF special forces camp, where the very capable commander took time from his busy schedule to host us and explain (within the parameters allowed) their special training and mission. We were able to mingle with some of his amazing young warriors, see and handle some of their weaponry, and each one in our party was presented with their unique insignia pin. One very special highlight for me personally was that Ezer had arranged for me to be dropped off one afternoon, to join a local rancher on the Golan Heights, to saddle-up and help him drive a herd of cattle over some very rugged and rocky country to better grass and water. After the drive, Nan was able to ride with me back to the corral overlooking the Sea of Galilee. Another great memory was a dawn baptism on the Sea of Galilee. Just before sunrise, we gathered by the shore for a brief explanation of the meaning and significance of baptism, some songs led by Pete Stadler, and a time of prayer. Then, as the dawn broke, ten people were baptized by several of the pastors present. Each was given an opportunity to speak of their faith in the Lord Jesus Christ to the assembled company. As the service concluded, the sun was rising and shining over the water! No doubt one of the favorite sites to many was Golgotha and the empty tomb. After Pete led us in song, God provided us with a very special guide—a Swedish believer who added much to our visit with his serious, yet humorous, presentation of what Jesus Christ accomplished for us in His death, burial, and resurrection. At most of the sites, various pastors shared opportunities to speak briefly on the biblical significance of that place. 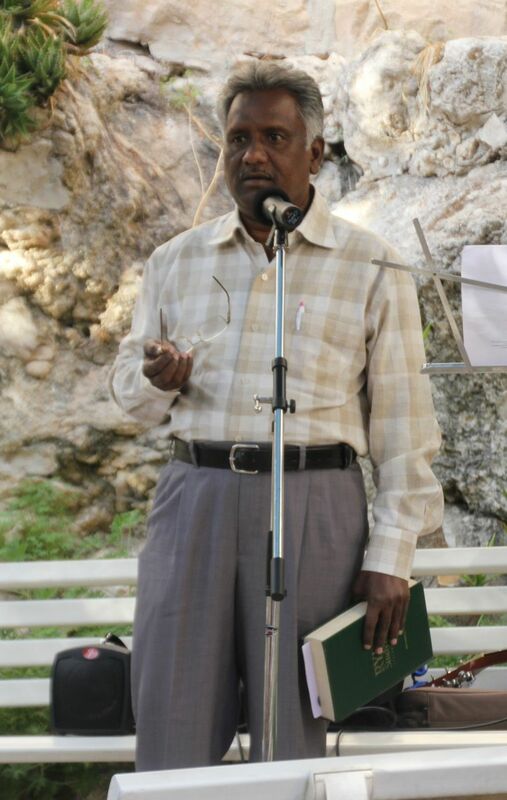 It was a great blessing to us to have Pastor John Francis and his wife Aruna along with us, and it was he who shared with us at the Garden of the Empty Tomb. Having known and worked with Pastor John for 20 years, and knowing his desire for some time to visit the Holyland, it was a treat to have him and Aruna accompany us on this journey, and to see the looks of wonder on their faces along the way. Then there was the walk through Hezekiah’s tunnel (definitely not for the claustrophobic), the tunnel tour beneath the Western Wall, and of course Yad Vashem, the Holocaust Museum (which you leave feeling emotionally drained). We were reminded that we are to “pray for the peace of Jerusalem” (Psa 122:6), and as Pastor Mike Bryant pointed out, this peace begins with reconciliation made possible through the substitutional sacrifice of Yeshua Ha’Mashiach—the Lord Jesus Christ. Our last event in Jerusalem was a very special Shabbat service and tree planting at the “9/11 Memorial” outside Jerusalem, which is dedicated to the memory of the twin tower victims. We planted two trees, then Ezer led us in the Shabbat prayer, and we greeted the beginning of the Sabbath (with reflections on Heb 4:1–11), with bread and wine—the same elements we had used in our earlier communion at the Garden Tomb. The monument has a waving American flag in its center, surrounded by the names of every person who died on that day—including the gallant fighters of United Airlines Flight 93. This service, which mingled so many biblical and historical elements, was a fitting conclusion to our time in Jerusalem. As we left Jerusalem, our faithful guide, Ezer, turned us over to the capable care of Sally, another guide, due to his father’s worsening condition. Though we all missed Ezer, we fully understood, as we prayed for him and his family during this time of trial. As we got to know Sally we found her to be a very capable guide, with a great sense of humor, as Pete repeatedly led us in the chorus of “Ride, Sally, Ride,” which she took in blushing stride. Our last stay was in Eilat on the Red Sea. From there we visited the mines of Solomon and Petra. I was more interested—as we walked through the Siq (canyon) to Petra—in seeing the looks on faces at the moment of discovery, than seeing the “city of the dead” itself. This was partly due to having been there before and partly due to the fact that I am an inveterate “people watcher.” As our guide skillfully turned our group’s attention toward the canyon wall behind us, I watched as people turned around at the precise moment the “treasury” building came into view. The looks of amazement were priceless. After a free day to explore Eilat, we flew to Tel Aviv, and began our journey home. Even while we were in the air over the Atlantic, the rockets started falling from Hamas in Gaza on the land of Israel. Predictably, the world blames Israel, while President Obama gives weak, meaningless statements. It is a matter of record that since the year 2000, more bombs have fallen on Israel from her enemies than fell on Britain during the entirety of WWII. Events are rapidly moving toward their climatic spiritual and historical end-game. The words of the prophets are ringing down through the ages, yet our world continues its deaf and blind shuffle toward oblivion—without Christ—therefore without hope or life. I am personally strengthened when I see God’s perfect timing for our Israel tour, especially knowing there were some who chose not to come due to fears of this kind of thing. The Lord of Sabaoth was surely with us, and we rested “under the shadow of His wings.” Yet more than this, we were enabled to share His love and story with others while we were there, dear friends now, who must remain behind and face the present onslaught. How we pray that their eyes may be opened to look fully in faith on the face of Him who was pierced for our iniquities. In closing, I should mention that Ezer called me on the night before we departed from Israel, to inform me that his father Motti had died early the previous Sunday morning. While we were touring, before his father’s passing, Ezer told us how his father was born a fighter. He was born in Poland to freedom fighters. His mother died first, fighting against the Nazi scourge, then later his father was killed, leaving Motti alone in a brutal and frightening world, just a small boy. He was cared for by various groups of freedom fighters, until he was taken in by a Christian farmer, who raised him. After returning to Israel, Motti was a member of the Israeli Airborne Forces, and in the 1967 war scaled the Golan Heights under heavy fire—losing many men to his right and left—only to reach the top and find the Syrians had fled, leaving coffee boiling on a camp stove, which he gratefully drank. We ask you to pray for Ezer and his family, for Sally, and for all Israel. History is moving rapidly forward. Having rejected the impact of Christ’s coming as “the Lamb of God,” our world is about to see the wrath of “the Lion of Judah.” Let us devote ourselves to prayer, that the convicting and illuminating ministry of God’s Holy Spirit may indeed bring about “the peace of Jerusalem,” which is to be found only in the Prince of Peace. Spirit of grace and supplication; then they will look on Me whom they pierced.